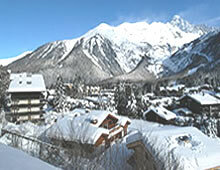 Love it or loathe it, everyone tends to have an opinion about Chamonix. Many argue that it's the capital of Alpine sport, with its position next to Mont Blanc, awe-inspiring scenery, a beautiful town, the Vallée Blanche, off-piste terrain to test the very best and the Grands Montets in Argentière. They'll tell you the nightlife rocks, there are plenty of good restaurants, things to do all year-round and it's just over an hour from Geneva airport. Sadly, there are drawbacks. Chamonix's skiing does favour more advanced skiers. Beginners might feel left out. It is also disjointed, made up of a series of smaller bus-linked resorts; getting about can be a right pain if you're without a car. It is very popular, so traffic can be terrible, while lift queues still vex the most relaxed (notably the top half of the Grands Montets cable car). It is also expensive, with shopping nearly toppling skiing as the favourite pastime, plus a lot of the skiing requires a guide (most of whom are excellent).